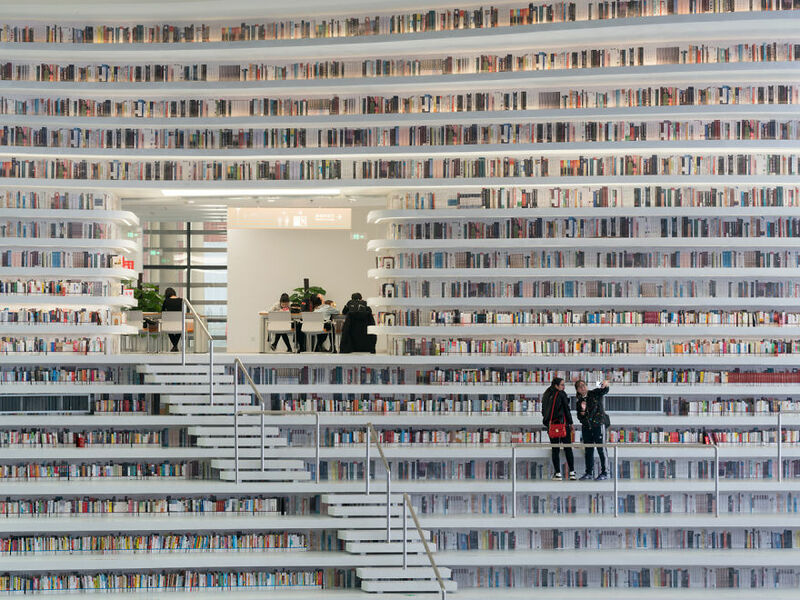 One of the coolest libraries has just opened in China and it is breathtakingly beautiful. The Tianjin Binhai Library has opened up in the Binhai Cultural District of Tianjin earlier this month. It is also called “The Eye of Benhai” because of its mirrored spherical centrepiece that appears like an eye. The library has five storeys with a dazzling futuristic interior featuring rippling shelves of books. It has layered terraces that double as steps and seats. There are books on shelves up to the ceiling and are out of reach, but no worries as the designer has used aluminum plates instead of actual literature on the higher terraces in order to keep up with the library’s aesthetic. The library spans over 34,000 meters (366,000 square feet) and can hold as many as 1.2 million books. There are children’s play areas, lounges, and reading rooms on the lower levels of the library, while the upper floors are mainly offices and audio, computer, and meetings rooms. The library is designed by the Dutch architecture firm MVRDV in partnership with Tianjin Urban Planning and Design Institute (TUPDI) and was ready after just three years of construction. The library is a part of the city’s effort to improve the region’s cultural frastructure. The Istanbul-Teheran-Islamabad (ITI) train corridor will be extended to Delhi-Kolkata-Dhaka (DKD) . This was proposed by a United Nations body to promote regional cooperation. एक अशी शाळा जेथे बालिकेच्या प्रवेशाचेवेळी तिचे रोपटे देउन स्वागत केले जाते व त्या रोपट्यास वाढविण्याची/संरक्षणाची जबाबदारी ती स्वखुशीने स्विकारते.एक अशी शाळा जी पक्षी,वन्यजीव, पर्यावरण संरक्षणाचे धडे विविध उपक्रमांच्या माध्यमातून देते. Indian-American Seema Verma was swore in as the head of top U.S. healthcare agency on Tuesday. The trillion dollar agency looks after health insurance programmes for everyone.